A primer on the Holy Spirit, this book addresses the problem of attempting a spiritual life without Spirit filling and offers practical applications that move the reader toward Spirit empowerment. 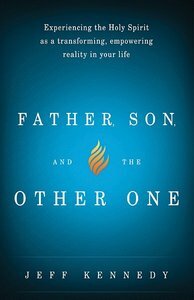 About "Father, Son and the Other One"
Jeff Kennedy is the executive pastor of adult Ministries and discipleship at Eastpoint, a large and thriving church in the Pacific Northwest. He also serves as an adjunct professor of religion at Liberty University Online. He holds a BA in biblical literature, a master of religion, master of religious education, and is finishing a doctoral degree in discipleship. When he is not teaching, writing, training leaders, or grading papers, he is spending time with his wife and four happy children.